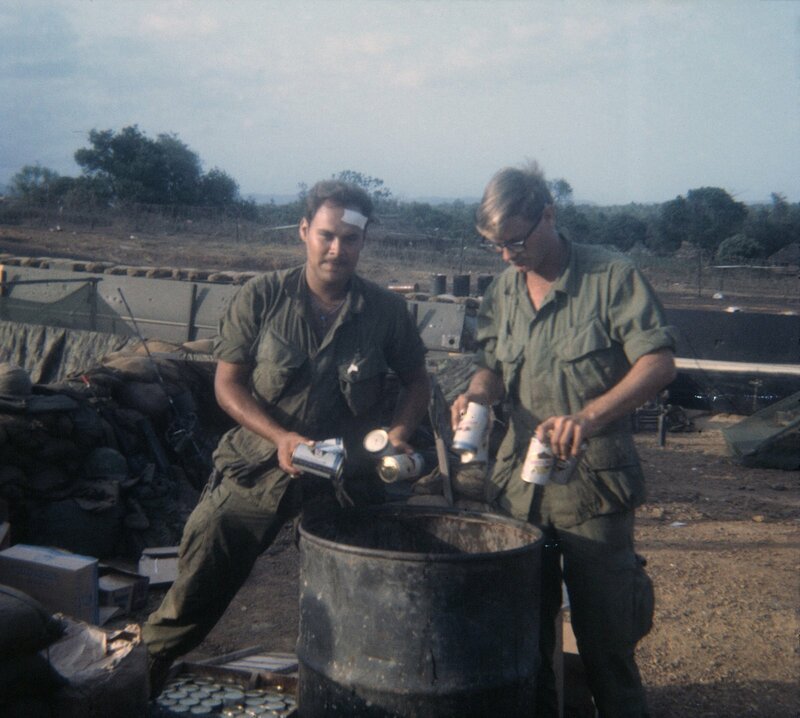 In late December 1967, we started examining options aimed at improving our lot in Bravo Company, commonly referred to in military jargon “as taking care of the troops”. Another factor highlighting the difference between combat and support soldiers in Vietnam was access to facilities considered essential for morale purposes. Most support soldiers had access to a variety of facilities that were not readily available to combat troopers, such as, Post Exchange outlets, movies, clubs, cafeterias, libraries, sports facilities, etc. Our mission not only limited our access to these facilities to the R&R leave periods, but also restricted our options on what we could do to improve our lot. One thing was very clear, it was up to us to take the initiative and after much speculation, we decided on a series of super deluxe barbeques for the whole company and this involved the fine art of “scrounging”. Scrounging probably dates back to the early days of the Army and it has always been a well-known and accepted phenomenon in wartime. In short, when your unit desperately needed something that was unauthorized or unavailable, you either did without or you tried to scrounge it. Needless to say, a super deluxe barbecue for 160 troopers was not available through “normal” supply channels and this is how we procured the necessary provisions. The first step was to select a suitable project manager and our Sergeant X had all the special qualifications required for these scrounging missions where discretion and an ability to make contact with the right sources were absolutely essential. For a successful scrounging expedition, you usually had to have something worthwhile to barter with and we had a huge supply of a very scarce product that every soldier in Vietnam longed-for - - a Czech Mauser rifle that could be taken back to the States as a trophy weapon because it was bolt-action and not automatic. Bravo Company always had a small supply of captured Mausers on hand, but this supply became abundant when we captured approximately 1,000 Mauser rifles in excellent condition. As a matter of fact, the metal parts of these captured weapons were still covered in preserving grease and each weapon was equipped with an attached swivel bayonet. 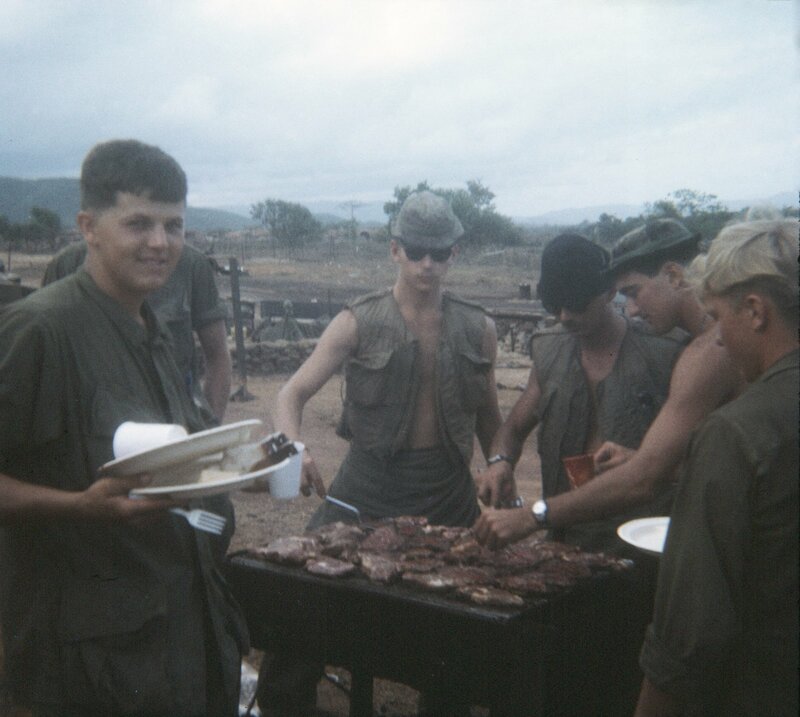 Young troopers had very healthy appetites and for each of our super deluxe barbecues, Sergeant X had the challenging task of procuring approximately 350 T-bone steaks (2 plus per trooper), baking potatoes, charcoal, 1,200 cans of coke/beer, ice, grill, paper plates, and so on. These special provisions were not available from local sources, but they could be procured at major US Air Force bases, like Cam Ranh Bay, which was located several hundred kilometers away. The Czech Mauser rifles made his job easier, but the timing of these barbecues depended on when we would be securing a firebase and which firebase. Therefore, it required a lot of careful coordination as all of the procured items had to be delivered on very short notice and it was also important that these barbecues were conducted on a low-profile basis. So discretion was not only important during the procurement of the various items, but also during the barbecue party itself. In addition, it was necessary to restrict the number of cans of beer allowed per trooper because of our mission. Although we followed a “don’t ask” policy concerning the details on how and where Sergeant X obtained these supplies, we did discover that one Mauser rifle was sufficient to get a pilot of a C-130 Hercules to fly several pallets of beer, coke and frozen steaks from Cam Ranh Bay to LZ English in January 1968. We all thoroughly enjoyed these company barbecues and they were excellent moral boosters. In conjunction with the super deluxe barbecue initiative, we also discovered that we had lot of money in what was called the Unit Fund. A portion of the profits from Post Exchanges was deposited in a special account for each unit, and these funds were strictly controlled by a unit council and with detailed records on decisions, disbursements, etc. In peacetime, these funds are used to purchase items for the benefit of the troops, like furniture for a common dayroom, but it was difficult to find items that would be beneficial to troops in a war zone. As none of the money in the Unit Fund had been spent since the summer of 1965, we had a considerable sum available. After much speculation, we decided on purchasing several cameras that troopers going on R&R could borrow. We also used the fund to pay the cost of making copies of the platoon and company photos for each trooper. Other major purchases included a reel-to-reel tape recorder and a stereo record player with a large selection of popular records, and we made extensive use of these during our company barbecues and when securing firebases. We also have some more facts on these barbecues and about our unit fund purchases. Bravo Company received advanced notice that we would stand-down on 1 March 1968. 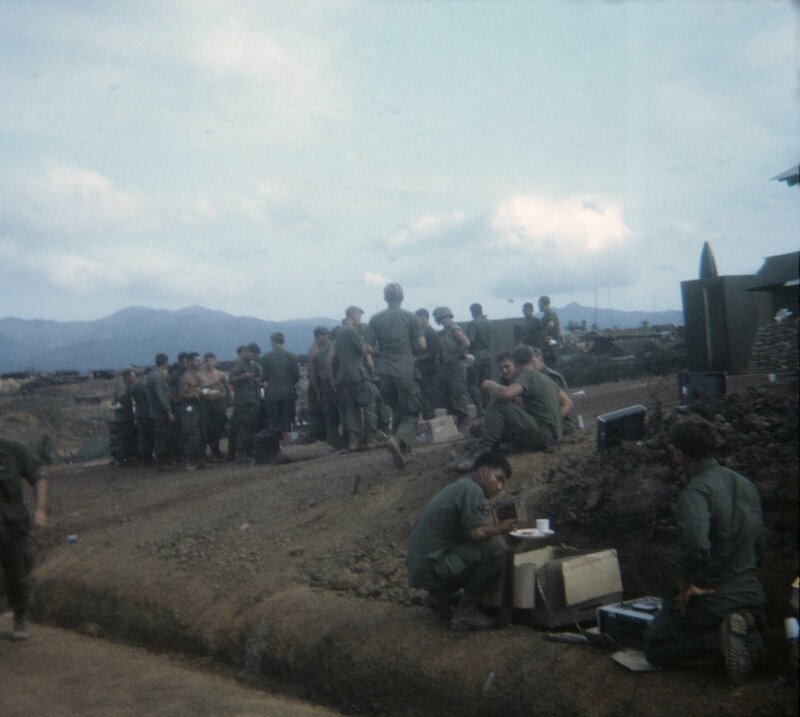 This meant that we would return to the firebase and have no mission for the night of 1 March. In other words, a well deserved break and time to relax. We interpreted this as a time to party and we only had a few days to make the necessary preparations. To make sure that we acquired all of the necessary provisions for our party, we dispatched two scroungers to two different bases. They were equipped with Czech Mauser rifles and they "procured 200 lbs of steak, 2000 cans of beer, pickles, cheese, sacks of charcoal, etc. 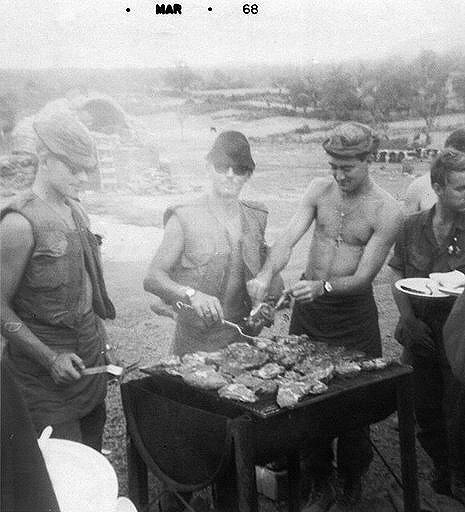 We lit the grill at 1600 hours and by 1700 hours, Bravo Company troopers started eating and drinking. By midnight we had 20 lbs of steak left and about 400 cans of beer so you can imagine what condition everybody was in. We had our new tape recorder hooked up and everyone relaxed and had a great time." On 27 December 1967, Bravo Company secured the firebase at LZ Laramie. We had purchased guitars with money from the Unit Fund and there was lots of guitar playing and singing on LZ Laramie. This firebase was located on top of a mountain and it was very stormy and cold on 30 December. To celebrate New Year, we conducted a mad minute with small arms and M-79 grenades at midnight. This above information is taken from letters that Peter O’Sullivan wrote home to his wife.